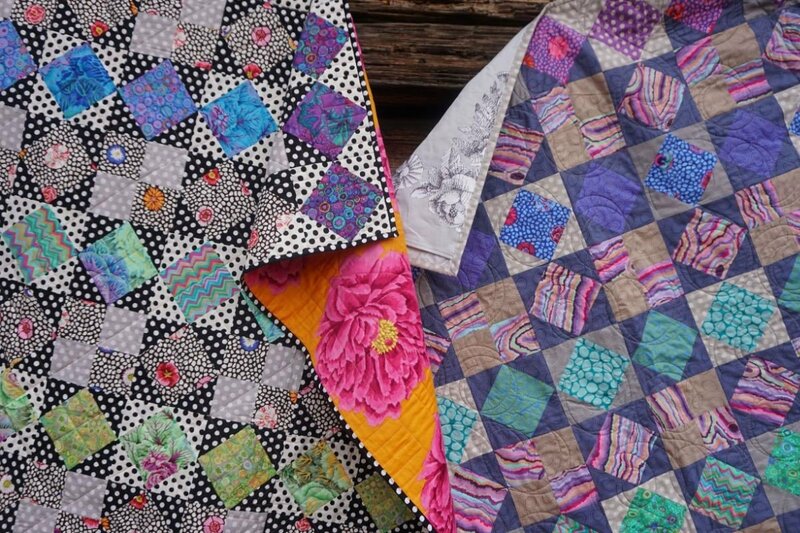 Introducing Kaffe Fasset's new Summer 2019 Quilt Along. This gorgeous quilt is 78" X 78" with simple blocks that showcase 18 classic Kaffe Fasset prints. There are two colorways to choose from: Sunset Colorway or Bold Colorway. Preorder your kit (either colorway you choose) now. The first 30 people to preorder their kit from Sew Much Fun! will receive an exclusive Kaffe Fasset Quilt Along Shopping Bag and a Summer Quilt Along 2019 fabric quilt label designed by Kaffe Fasset! You will receive the entire kit for the Bold Colorway OR Sunset Colorway in late April/early May. The final balance of $125.00 will be due when you pick up your kit. Your $10 sign up fee guarantees you a kit AND the first 30 to sign up will receive their kit in an exclusive bag along with a quilt label. Plus $125 for kit when it arrives.